There were good times and bad times – and then there were devastating times. If you’re a fan of the the Sens, Wings, Isles, Pens, Preds, Blues, Jets or our dear Canucks, you fall into that last category. There was a lot of variety this round, brawls, sweeps, and an endless game of musical goalies (Crawford-Darling-Crawford. Hammond-Anderson, Lack-Miller) As usual, there was something to cheer or jeer for everyone. From playoff beards to disappearing pucks, let’s breakdown the best and worst from the first round of the 2015 Stanley Cup Playoffs. He basically stood on his head. There was a bit of a bump in Game 5 where the Habs lost 5-1 but by Game 6 the Price was back to being right. 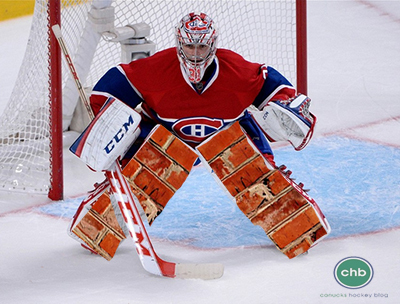 He made 43 saves and closed out the series with a shutout. Something tells me Stamkos and the Bolts are in trouble. He stood on his head, just like Price, but without Shea Weber the Nashville Predators just couldn’t close the door on the Chicago Blackhawks. Rinne made big saves and even showed off his magic skills by making the puck disappear for three entire minutes in the middle of Game 4. Despite his sorcery, the Preds just couldn’t make it through. These guys showed the rest us of jaded, bitter hockey fans how to love your team unconditionally. From the white out wear to the roaring jeers and boos (for Corey Perry and Ryan Kesler, good choice!) to the standing O salute when their team lost the series, they were nothing but a joy to watch and almost made me feel guilty for being so grumpy about my Canucks. Almost. Andrew Hammond had a nation behind him (not really, just a bunch of people in Nepean and Kanata) and was supposed to be the Montreal Canadiens kryptonite. Except that he wasn’t. Not even close. 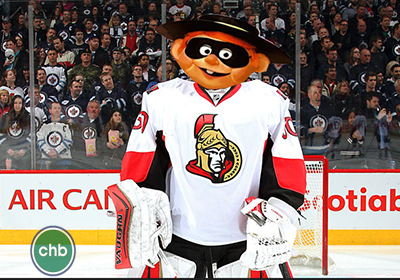 He made it two games, letting in seven goals on 81 shots, and causing the Sens to replace him with Anderson. The hole was already too big and now the Sens are golfing. The entire Vancouver Canucks team excelled at only two things in Round 1 – fights and failure. In the final game of the series, when they blew a 3-goal lead to lose 7-4, I could have sworn I was watching the Maple Leafs. That’s not a team you want to channel, Canucks. I still love them and I know we’re lucky we even made playoffs but that last game… ugh. Forget Geno, Evgeni Malkin’s new nickname is The Invisible Man. The Russian star, who makes 9.5 million dollars a year, was not only held without a point during the playoffs, he’s had no goals in his last 15 games and no points in his last 10. 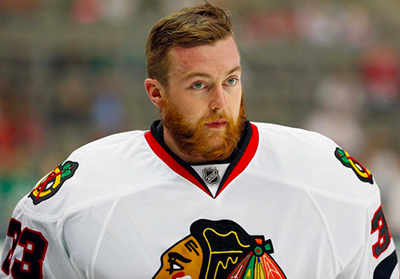 The Blackhawks back-up goalie is beardtastic. When not stepping in to save a struggling Corey Crawford I think he’s trying to create a new style trend – Hipster Amish. This beard is full and thick with a hint of ginger. By the end of Round 2 he’s going to look like a member of ZZ Top. I used to say the only thing Sidney Crosby fails at is facial hair (and playoffs since 2009). 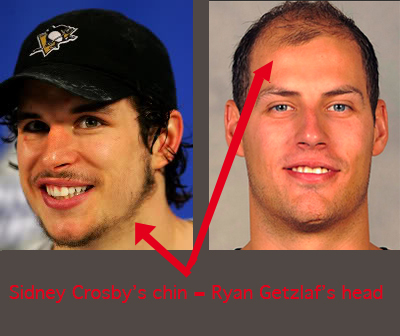 This year I realized his jawline looks like Ryan Getzlaf’s head before Ryan figured out how to use a razor. What are your best and worst moments from the first round? Let us know!